Home » Funding Our Future! Unending debt, higher class sizes, rising parking fees, cuts to Centers and Institutes, higher tuition and fees, staff layoffs. Sound familiar? For public sector faculty, these are part of our daily lives and also are symptoms of a systemic problem – the underfunding of public education. The nonpartisan Foundation Budget Review Commission found in 2015 that the state is underfunding our pre K – 12 schools by more than $1 billion a year. And the Higher Education Finance Commission found that our public colleges and universities are underfunded by more than $500 million a year. The Fair Share Amendment, which had widespread support across the state, would have resulted in revenues targeted toward closing this funding gap in public education. But the Massachusetts courts took that possibility away. 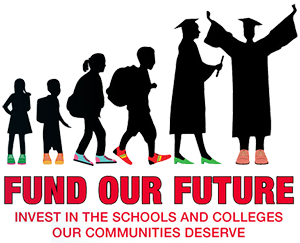 Our union, the Mass Teachers Association, has launched a new FUND OUR FUTURE campaign to push the Massachusetts legislature to increase state funding for PreK-12 schools by more than $1 billion a year and for public higher education institutions by more than $500 million and to ultimately pass new revenue measures that would sustain that funding over the long term. The campaign starts with conversations in schools and colleges about what we need for our public university so that we can continue to meet our urban mission. The plan is then to take these conversations to wider audiences in our communities and to our stakeholders. In the winter and spring, the campaign will focus on getting our legislators and the Governor to act. MTA Vice President Max Page will be here to talk more about the campaign and to start the conversation on our campus. This really is a campaign for our future and for the future of our students, children, and university. Without proper state support, we will continue down the austerity path and increased costs to students and parents. See you on the 19th. RSVP to let us know you are coming!